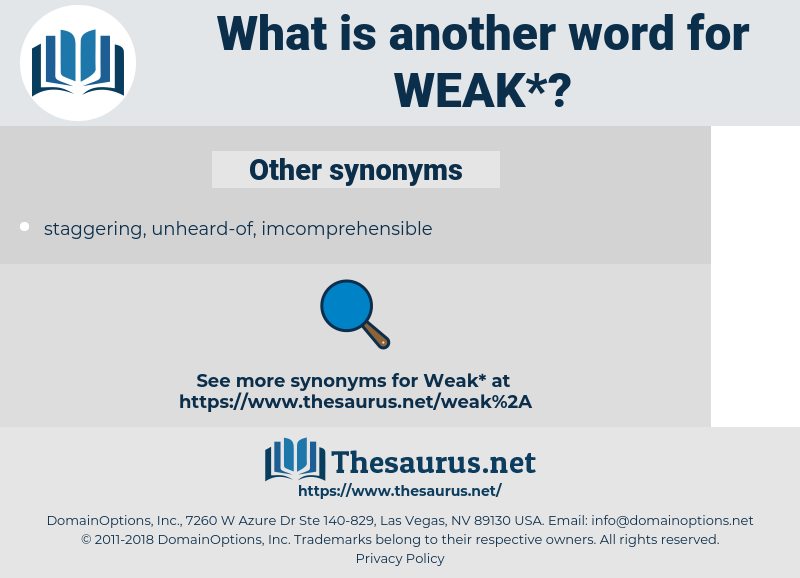 What is another word for weak? feeble, tenuous, flimsy, vulnerable, debilitated. faint, scarce, insubstantial, modest, unconvincing, depressed, slim, mediocre, insignificant, substandard, meager, scant, loose, narrow, underprivileged, bleak, unsound, timid, flagging, low-level, infirm, few, delicate, impossible, brittle, undeveloped, handicapped, imperfect, inconclusive, spineless, incomplete, sensitive, impaired, Half-hearted, negligible, lukewarm, disabled, limp, retarded, impotent, helpless, diminished, lenient, inferior, marginal, insecure, enfeebled, sub-standard, disappointing, low-dollar, paltry, unfavourable. Deficiencies, shortcomings, reviews, dive, periods. sluggish, lackluster, shaky, lacklustre, disadvantaged, precarious, unsatisfactory, powerless, weakly, ineffective, weakened, slack, anemic, underdeveloped, inefficient, ineffectual, minimal, anaemic, sparse, vague, defective, lax, ill, watered-down, unstable. loud, unbreakable, capable, powerful, steady, able, fit, confident, noisy, secure, safe, brave, protected, hearty, definite, firm, stable, unshaky, sure, bold, sufficient, concentrated, active, certain, healthy, unwavering, potent, thick, guarded. moral, imperceptible, rugged, tyrannical, righteous, principled, ethical, Vitalized, confirmed, nonhuman, senior, credible, resolute, substantiated, husky, demonstrated, stressed, enlightened, undiluted, magisterial, major, athletic, organized, validated, fresh, sensible, right, strapping, mettlesome, virtuous, clear, dictatorial, established, sane, Backboned, unperceivable, skilled, wise, dominant, ordered, irregular, authoritarian, up, accented, plausible, invigorated, high-level, upright, smart, top, conspicuous, brilliant, evaporated, autocratic, infallible, corroborated, recovering, condensed, true, efficient, despotic, daring, bright. I'm weak from long waiting. I always thought him a weak young man, and he wouldn't have done you any good.